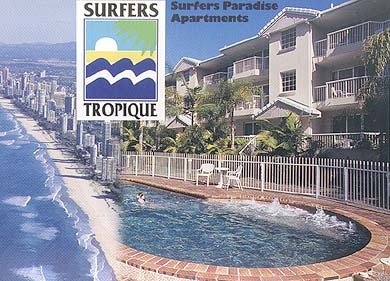 Surfers Tropique is 3 levels of modern 2 bedroom, 2 bathroom, modern low rise apartments conveniently located near the excitement of Surfers, yet nicely secluded in the private precincts of Surfers Paradise , just 200 metres to the beach and close to the Casino at Broadbeach. The building was designed so that all of the apartments face north or east and have balconies, opening from spacious living and dining areas, overlooking the lush tropical grounds and pool/barbecue area. Surfers Tropique is just 250 metres to a patrolled beach and only minutes away from central Surfers Paradise and Broadbeach including Jupiters Casino, the Broadbeach Bowls Club, the huge Pacific Fair Shopping Complex, and the Oasis Shopping/Hotel Resort with Monorail to the Casino. Amenities in this lovely complex include a large outdoor swimming pool and spa (heated in winter) and barbecue facilities, set in spacious fully landscaped tropical gardens. 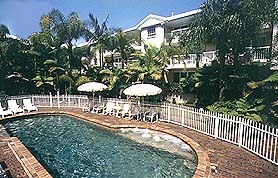 Relax by the pool and spa, enjoy a barbecue or explore what the Gold Coast has to offer you. Your Hosts look forward to welcoming you and ensuring you have a great holiday. Your hosts can also arrange tickets to the theme parks, boat cruises, day trips to the hinterland, car hire, etc. 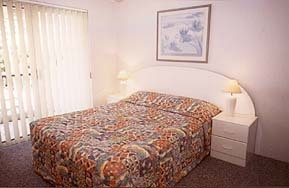 Their aim is for you to have a great Gold Coast Holiday!